Even today, many people still don’t know about the contentious issues that surround diamond production. Most people’s first experience of buying a diamond is when they plan to get married, and when caught up in all the excitement that brings, unless you have prior knowledge of the blood diamond issue, it may not be something that’s on your agenda. 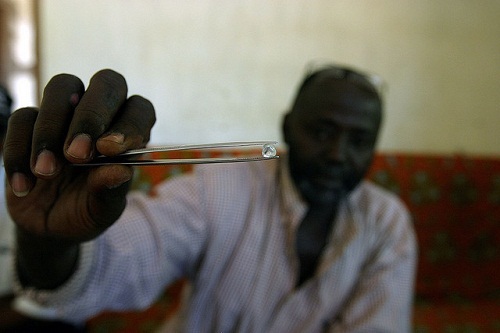 Blood diamonds first became a real talking point in the late 1990s. One of the first organizations to raise awareness of the issue was Global Witness. In 1998, it released a report that exposed the role of diamonds in funding the civil war in Angola. Over time, international pressure from various organizations forced the diamond industry to move to try to eradicate these blood or conflict diamonds from society. At this same time, new markets in diamond alternatives and synthetics began to pop up to address consumer ethical and environmental concerns. In 2003, the Kimberley Process Certification Scheme (KP) was set up. The scheme requires governments to confirm that their shipments of rough diamonds are conflict-free by putting in place controls to stop the stones from entering the supply chain. There were 75 countries participating in 2010. Trading can only take place amongst members of the KP. NGOs and the diamond industry observe and take part also. Although it has achieved much, one of the main disadvantages of the KP is that it is only concerned with rough diamonds, or those that are mined and then sold on to other countries to be cut and polished. If a conflict-free diamond gets to this point, it may still end up being cut and polished in a sweatshop in India where workers are paid very little and are forced to work in awful conditions. These diamonds then work their way onto the market and buyers may be left thinking they have bought a conflict-free diamond, without the knowledge of the unethical practices that followed. Other problems linked to the KP include a lack of focus on human rights, a lack of funding and an ineffective decision-making system. It has also been accused of inadequate monitoring and a slow response to crises due to its inefficient structure. It was issues such as these that prompted the movement towards the sourcing of ethical diamonds. A handful of companies have sought to eradicate the problems that the KP does not address by importing traceable diamonds that can be guaranteed to be conflict-free and that are cut and polished in good working conditions and for fair pay. At present, Canada is the only country to have implemented a system to trace all diamonds from the mine. Canadian stones are also mined according to strict environmental laws, with fair working practices, with sustainable development plans and with the input of indigenous people. This makes them the most ethical option right now. The recent launch of Eco Diamonds, fairtrade and fair-mined gold offers hope that diamonds could follow. However, fair trade diamond certification standards are only in the very early stages of development and whilst hopes are high that this will happen, they will be some time coming. In the meantime, whilst investigative journalism reports and films such as Blood Diamond continue to have an impact, it will be up to consumers to put pressure on jewelers and industry bodies to ensure diamonds are manufactured more fairly in the future. Several jewelers specializing in ethical wedding rings, engagement rings and other fair trade jewellery, such as London-based Ingle and Rhode, have begun to transform the diamond marketplace for the better. Hopefully with more consumers demanding a transparent process, we can eliminate blood diamonds and other un-ethical diamond processing practices for good. Jewelers who are in support of these initiatives should educate their customers about these ethical standards a bit more aggressively by making the information readily available on their website. Let’s face it, buyers normally wouldn’t care about these things as long as their getting a good deal on a diamond.